Luminance HDR is a photo editing tool which provides users with the ability to create HDR images from a variety of different RAW formats, most notably those created by Nikon, Canon and Sony cameras. Other brands are supported. If you're unsure what HDR is, it stands for High Dynamic Range. This is a type of photography which usually stacks a series of images together to increase contrast. Version 2.5.1 is a freeware program which does not have restrictions and it's free so it doesn't cost anything. For security reasons, you should also check out the Luminance HDR download at LO4D.com which includes virus and malware tests. Additional screenshots of this application download may be available, too. 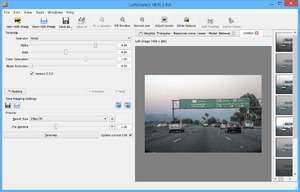 Luminance HDR download been highly rated by our users.